In the August issue of The Florida Writer, there is an article by Martha Alderson; “How to Use a Plot Planner”. Martha Alderson is a historical novelist and the best-selling author of The Plot Whisperer. She is founder of PlotWrMo and has worked with hundreds of writers in plot workshops, retreats, and plot consultations for more than fifteen years. 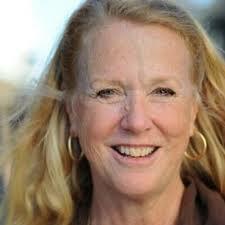 Her clients include bestselling authors, New York editors, and Hollywood movie directors. She has authored six additional plot books. A Plot Plan is a line which rises from left to right. The line recedes when a crisis or moment of tension is past, and the steepness is an indication of the rate of increase or decrease in the tension. An example is shown below. “At its core the Plot Planner is merely a line that separates scenes filled with conflict and excitement (which appear above the Plot Planner line) from those that are passive, filled with summary and backstory, or heavy with information (which appear below the Plot Planner line). “In every great story, a protagonist pushes toward something (her goal) while forces both internal and external attempt to thwart her progress. This struggle between the protagonist and the antagonist sends the energy of your story soaring. The more powerful and formidable the antagonists, the greater the intensity, drama and excitement in the scene. “Like the surface of the sea with its white caps, waves and swells, the external, griping territory of the dramatic action, when your protagonist is out of control, fearful, lost, confused, or under the power of an antagonist, belongs above the line. 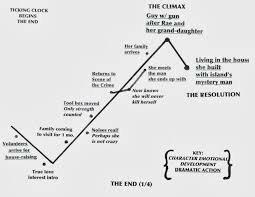 All scenes that show complications, conflicts, tension, dilemmas and suspense where the protagonist is forced away from her goals belong below the line. “Scenes that show action where the power is somewhere other than the protagonist should go above the line: conflict, catastrophe, betrayal, deception, vengeance, rebellion, persecution, rivalry, conspiracy, suspicion. Scenes that show emotional development of the protagonist also belong above the line: failure to cope, revenge, self-sacrifice, loss of control, anger, poor decision-making, grief, fear, greed, unhappiness, personal flaw, loss of power. My reaction is that there are some interesting concepts here, particularly in the differentiation between what goes above or below the line, and also the various notions about character development and the management of tension is a story. While I think it is very useful to think explicitly about character development, the maintenance of tension, and the purpose of each scene, I don’t think that I would want to plot out each chapter or the whole story. I think that in the future, when I’m writing a summary of what will happen in each chapter, I will also mention why it is happening.